Governor Andrew M. Cuomo today announced that all Long Island State Parks and beaches are expected to open by Memorial Day weekend. Albany, NY - April 8, 2013 - Governor Andrew M. Cuomo today announced that all Long Island State Parks and beaches are expected to open by Memorial Day weekend. Due to Superstorm Sandy, many of the parks suffered extensive damage to roads, landscaping and infrastructure while beaches experienced significant dune and beach erosion including the loss of natural and native vegetation. Numerous construction and repair projects are on schedule which will allow the parks and beaches to open for the holiday weekend. More than 20 emergency contracts are currently in progress across Long Island on state park land as hundreds of workers are repairing, replanting and restoring the damage left by Sandy in an effort to meet the public’s needs in time for Memorial Day weekend, the unofficial kick-off to the summer season. In 2012, more than 18 million people visited State Parks and beaches on Long Island. Last year, four state parks on Long Island ranked in the top ten most visited in the entire 179 New York State Parks system (#2 Jones Beach State Park, #4 Robert Moses State Park, #6 Sunken Meadow State Park and #10 Heckscher State Park). The latest study conducted by the Political Economy Research Institute of the University of Massachusetts found that visitors to State Parks support up to $1.9 billion in output and sales annually. Of the $1.9 billion, the Long Island region accounts for the second highest total, bringing in more than $410 million dollars yearly. Approximately 40% of the total number is attributed to people coming from outside the community to visit a park and spending on transportation, lodging, groceries, restaurants and other shopping. Below is a status report for some of the most popular State Parks and beaches on Long Island, including the work that is being done or has been done, and the expected status for the Memorial Day weekend. Current Status: The Park suffered significant damage to trees; however it is fully operational with no restrictions. There was also roof damage to the Annex which has been repaired. Memorial Day Weekend Status: OPEN – Tree stumps and debris will still be stockpiled and a tree contractor will be working in the park during the summer. Current Status: Tree repair, cleanup, stump grinding and fence repair along the park boundaries are ongoing. Storm debris is being stockpiled in preparation for contractor removal. Memorial Day Weekend Status: OPEN – Tree work and fence repair will be on going. Current Status: All facilities within Bethpage State Park that are scheduled to be open are open. Tree removal is still underway but normally closed facilities this time of year will open as scheduled. Memorial Day Weekend Status: OPEN – Tree work will be complete. Current Status: Fence repair is ongoing. Memorial Day Weekend Status: OPEN – Fence repair will be ongoing. Current Status: Four foot-trail wooden bridges were damaged and need to be replaced on the south side of park. Many of the trails have been cleared in the fishing access sites. Contractor needs to finish the tree cleanup and hazardous tree removal. Memorial Day Weekend Status: OPEN – Bridge replacement and tree cleanup will be ongoing. Current Status: The Overlook Pier was being repaired from Hurricane Irene, and some additional minor damage was caused by Sandy. Park forces are continuing to rebuild the damaged Pier. The Main Fishing Pier was slated for repairs which are underway via a contract that started prior to Sandy striking the park. There are roofing repairs to be completed via an emergency contract. All debris from the storm has been removed from the park. Pilings in the main marina have been replaced. Captree's floating launch ramps have been removed from the bay and mostly restored by park staff. Memorial Day Weekend Status: OPEN – Repairs will be ongoing. The Overlook Pier will be complete. Current Status: Caumsett received extensive erosion along the 2.5 miles of beachfront along the Long Island Sound including loss of elevation and depth of the beach. Hundreds of cubic yards of debris washed up along the shoreline and into the Salt Marsh. Contractors are currently cleaning the debris off the beach prior to Piping Plover season. Plank road that leads from the Fisherman's parking lot to Lloyd Point is damaged for about 0.2 miles due to erosion from the LI Sound into the Salt Marsh. Over 285 trees were damaged or destroyed along the park’s roads and trails which are now clear at the base. Two skylights were blown off of the historic Bottling Building at the Dairy Complex and have been replaced. A tree damaged the facade of the Polo Pony Barn and has been repaired. Memorial Day Weekend Status: OPEN – Debris removal will be complete and damaged trees will be removed. Repairs to Plank Road will be ongoing. Current Status: Connetquot had minimal structural damage. The only damage was the screen door on the Administration Building and the following items on the Main House: one chimney crumbled (still needs to be repaired), bricks breaking one of the skylights (has been repaired), further roof damage (scheduled to be replaced). No major damage was done. There is some tree and debris cleanup that is required. Memorial Day Weekend Status: OPEN – Tree cleanup will be ongoing. Current Status: Both beaches suffered severe dune erosion and loss of natural vegetation. Workers are rebuilding the dunes and replanting more than one million American Beach Grass plants (native vegetation). Current Status: There was significant erosion at West Beach. Contract was awarded to replenish the beach with 3,000 cubic yards of sand. There was significant erosion at Field 7 and substantial damage to the bike path and parking lot. A consultant is charged with redesigning the parking lot to retreat from shore. Water sports can be accommodated at the swimming beaches until the swimming season commences. Storm surge damaged transformer and fuses at Overlook Beach. A contractor has been secured to perform the repair work. Memorial Day Weekend Status: West Beach will be fully OPEN. The bike path at Field 7 will be temporary relocated, and access for water sports will be made available. The redesign of site and the changes will be ongoing. Current Status: Park lost approximately 400 trees. Parking field #1 has reopened. One of the buildings suffered minor damage, but it was repaired shortly after the storm. Memorial Day Weekend Status: OPEN – Tree work will be complete and building was repaired. Current Status: Jones Beach State Park suffered significant damage due to Sandy. The storm surge coupled with high tide resulted in major components of the park being submerged in sea water. The famous boardwalk suffered severe damage when the high tide caused the pilings to heave, lifting the boardwalk in many sections resulting in the surface of the boardwalk to be undulating. The piles have been reset with additional piles installed at Central Mall, and the decking is being repaired. Many of the park's electrical vaults were submerged, and work is ongoing to replace and raise these panels to prevent damage from future storms. Power has been restored to the West End, West Bathhouse, and Jones Beach Theater. The work at the Box Office is substantially complete and State Parks will be issuing a Certificate of Occupancy for that structure. It is anticipated that other remaining areas will be back on line shortly as contractors continue with making repairs. The Jones Beach Theater was submerged in at least four feet of water, damaging the VIP boardwalk and tented areas, the orchestra seating, the entire electrical system for the facility. All of the concession related equipment and supplies, offices and the box office were destroyed. The licensee is currently replacing and repairing the facility to ensure that the venue is ready for the 2013 concert season. The Field 10 fishing piers and the boat basin dock were severely damaged as well as the concession operated Bait Station. Tons of debris have been removed from the park. Lifeguard buildings and umbrella stands were destroyed. Contractors have started work on the lifeguard stands at Central Mall and Field 2. The contractor will be deploying more staff to complete all the buildings. Brick walkways, concrete walkways and the east side Field 6 parking lot were severely damaged. A contract has been secured and the repair work has started. The park (fields 2, 6, 10 and West End 2) is currently open to the public. The areas between the West Bathhouse and the East Bathhouse are closed mostly due to boardwalk damage and reconstruction. Memorial Day Weekend Status: OPEN – The Jones Beach boardwalk will be usable. There will be areas with temporary railing until the material comes in. State Parks was in the final phase of replacing the boardwalk decking on the west side of the park in Fields 1 and 2 prior to the storm. This contract will be ongoing throughout the season.The electrical equipment for the vaults will be replaced. It is anticipated that this work will be complete by Memorial Day weekend; however, if the vaults are not complete, they will operate under generator power. The repairs to Field #10 fishing piers and the Boat Basin will be on-going. The lifeguard buildings and umbrella stands will be under construction with some complete by Memorial Day weekend. Temporary trailers will be set up in those areas that the new buildings are not complete. Current Status: Orient Beach State Park is still closed following Sandy. The 2 mile long Park Entrance Drive and Gardiners Bay shoreline sustained serious erosion, and four sections of asphalt roadway (approximately 2120 feet) were damaged. The buried utilities along the entrance drive were exposed. All of the buildings in the park were flooded. The storm surge washed lifeguard shack and picnic tables from beachfront. Approximately 31 trees along the entrance drive and picnic area were damaged and/or destroyed due to storm surge and flooding. The Department of Transportation is repairing approximately 2120 feet, and four sections of roadway have been cleared of damaged asphalt, graded and is ready to be paved (weather permitting). DOT anticipates paving in the next couple of weeks as weather warms up. All utilities reburied along entrance drive shoulder; telephone lines repaired. Water Treatment Facility restored and operating, chlorinator installed above flood zone. Two large "rip rap" slopes have been installed along two sections of eroded roadway to protect new roadway. Approximately 4,500 yards of sand/gravel has been used to restore an 880 inch berm to protect building complex. Maintenance Barn walls replaced, electrical outlets replaced and raised and the burner repaired. Memorial Day Weekend Status: OPEN – Repairs will be ongoing. Current Status: The Greenhouse had 30 panes of glass broken on the 2 wing canopies. More than 100 trees were lost to either uprooting or broken trunks. In the marina areas, extreme high tides flooded out the shoreline buildings. Chain link and post and rail fencing destroyed from falling trees and limbs. Multiple signs had been broken or damaged throughout the park. The park was re-opened to the public within a week and a half after the storm. The shoreline along the Nissequogue River sustained minor erosion. Current Status: Most areas of the arboretum are open to the public. All of the smaller trees have been removed by park forces. The removal of larger trees, pruning and cleanup of over 100 trees that remain will be ongoing. Work is expected to be completed before the end of April. Damage to the Camellia Greenhouse will be repaired this spring. A temporary roof was installed to ensure the protection of the greenhouse collection. State Historic Preservation Office (SHPO) review has been completed; the contractor is now fabricating the new structural members. Damage to an existing overhead electrical line has been temporarily repaired. The replacement of the informational shelter that was destroyed has been cleaned up. Memorial Day Weekend Status: OPEN – The damaged section of the Camellia Greenhouse will be under repair. A few trails and the Greenhouse will be open. Current Status: Robert Moses State Park suffered significant damage. The south side of the park's traffic circle collapsed into the Atlantic Ocean, closing the park since October. Restoration of the road is underway. The boardwalk at Field #5 was severely damaged. A contract for removal and restoration of components is ongoing. A breach of the water system within the park has been repaired along the north side of the park. The state Department of Environmental Conservation (DEC) has approved the placement of stone material to protect this and other infrastructure located on the bay side of Robert Moses. Repairs to fences throughout the park have been made. Much of the debris that has washed onto the park has been collected and staff continues to load dumpsters and have the material carted out of the park. Final repairs to the flooded golf course will begin when the growing season begins. No anticipated delay in golf should be realized when the park opens in late May. Hundreds of thousands of cubic yards of sand were swept away by the storm. Two contracts have been awarded to replenish sand at Fields #4 and #5, the easternmost fields of the park. It is anticipated that over 500,000 cubic yards of sand will be placed on those beaches. Over 300,000 cubic yards of this sand is being dredged from the Captree State Boat Channel and the remaining 200,000 cubic yards from a stockpile of sand on the western end of the park. Three lifeguard shacks and other lifeguard equipment will need to be replaced prior to Memorial Day weekend. Memorial Day Weekend Status: All parking fields will be OPEN. Parking capacity may be reduced depending on the amount of space available for beachgoers. A decision on beachfront access and swimming operations will be made just prior to Memorial Day weekend after an evaluation of the sand replenishment program. It is anticipated that dredging will still be ongoing until the end of June. At that time, another re-evaluation will occur to determine operating capabilities. Current Status: The dike located at Field #3 was breached. The design of a bridge and shoreline stabilization has been completed by a consultant. The permit has been issued and State Parks is working with DEC to obtain their permits. The park had between 400 and 500 trees either uprooted or damaged. The clean-up is ongoing. There was damage to chain link, split rail, and stockade fences throughout the park. At the west beach, there is some erosion along the bluffs; however, some beachfront was gained due to the storm. Memorial Day Weekend Status: OPEN – except for access to the eastern part of the park that was provided by the dike that was breached. Current Status: The tree contractor has completed all the tree work with the exception of removing debris from the parking lot. Trails are now open. On the Hendrickson Ave side of the park, there are logs to be removed and more stumps to grind. Memorial Day Weekend Status: OPEN – There will still be tree debris and uprooted trees in areas of the park. Current Status: Wildwood State Park had significant tree damage. There is still tree damage that is being worked on in the campground. There was beachfront erosion. The beach is still closed due to the storm. The beach access road has been washed out and there is some damage to the bathhouse. A contract has been awarded for this work. Currently, the park has reopened nearly all its trails and picnic area. The campground has been opened and most of the hazardous trees have been removed. Cleanup of branches and wood pile and the removal of a large number of stumps are underway. 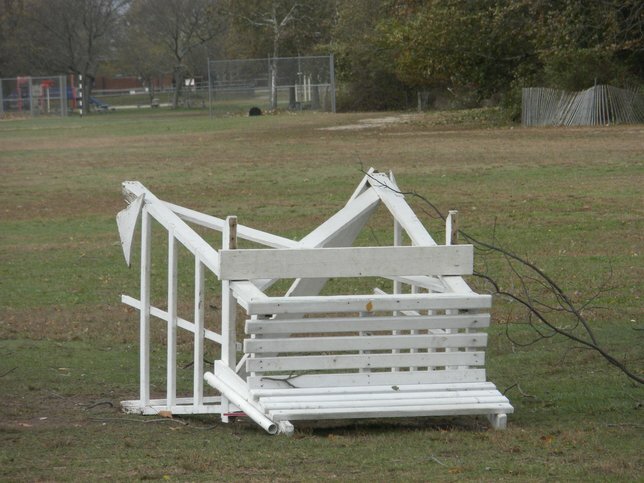 Photo: A lifeguard chair blown into a field at Sunken Meadow State Park, days after Sandy. Subject: LongIsland.com - Your Name sent you Article details of "Governor Cuomo Announces all Long Island State Parks and Beaches on Schedule to Open by Memorial Day"